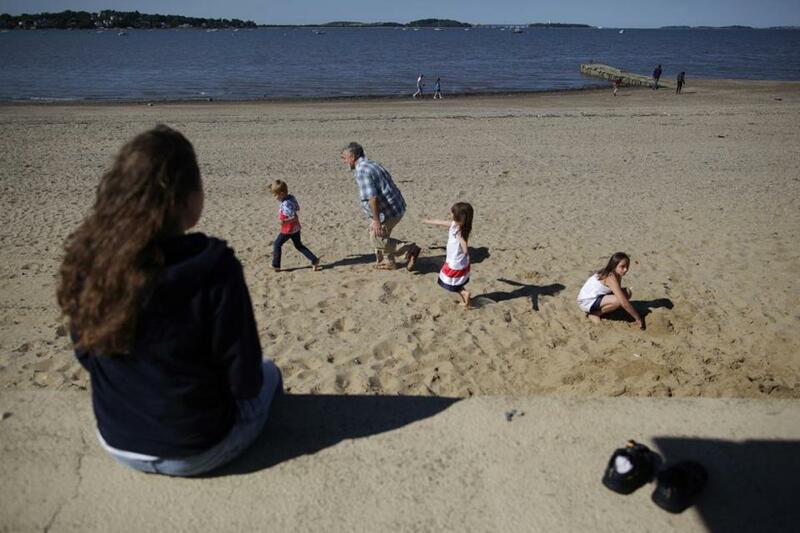 David J. Blaney played with his children on Wollaston Beach in Quincy June 14, 2012. Ten beaches on the South Shore were closed because of bacteria contamination, including Wollaston Beach. Sun-starvedbeachgoers could be able to spend more time taking a dip this summer under a proposal Wednesday from health regulators that aims to close beaches less often because of contamination fears. Revised water testing rules propose that a beach not be closed unless water samples from two consecutive days show elevated levels of bacteria. The germs can pose a range of health risks, including gastrointestinal and respiratory illness. Under the current system, beaches are closed after a single water sample is found to have high bacteria levels. In most cases, a follow-up sample the next day comes back clean. That means many beaches are closed unnecessarily for a second day, said Suzanne Condon, director of the state’s Bureau of Environmental Health, which regulates beach testing. The bureau is part of the Public Health Department. The bureau estimates there would be about 240 fewer ocean beach closings in summer than under current rules. “Our 13 years of beach testing show that approximately 80 percent of beach postings occur on days when the water tests results are acceptable,” Condon told the state’s Public Health Council, an appointed body of academics and health advocates that sets public policy. She said unnecessary beach closings hit surrounding businesses hard and create increased work for already-strained local health departments, which are responsible for collecting the samples. The state picks up the tab for local water analysis, through a grant from the US Environmental Protection Agency. Some members of the Public Health Council expressed concern that relaxing beach closing requirements might leave swimmers vulnerable, while favoring local businesses. “Our job is to protect the public, and this presentation sounds like, ‘Let’s make it easier for the businesses,’ ” said Harold Cox, an associate dean at Boston University’s School of Public Health. But Condon said that EPA data collected before Massachusetts required beach testing in 2000 indicated that, even then, very few people were sickened by dirty water. New Jersey and Connecticut have adopted similar regulations, she said. Condon said that usually 20 percent of beach closings each season involve a small number of beaches that have a history of contamination problems. These problem beaches would continue to be required to close after a single water sample shows elevated contamination levels. Problem beaches would be those where samples collected on two consecutive days exceeded acceptable bacteria levels in at least two of the last four beach seasons. area beaches operated by the state Department of Conservation and Recreation : Constitution in East Boston; Kings in Lynn; Malibu and Tenean, both in Dorchester; and Wollaston in Quincy. The Health Department will have a public hearing April 28 on the proposed change.